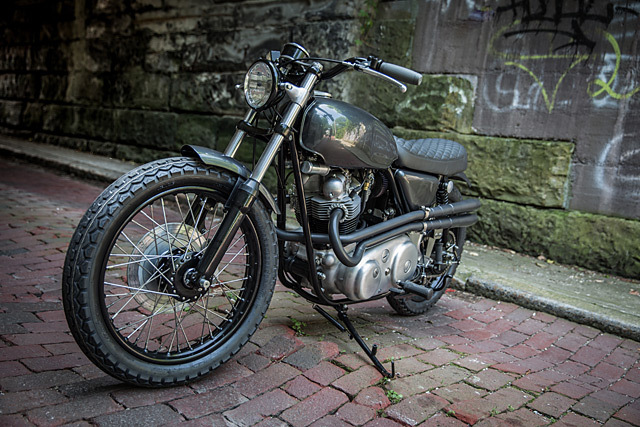 It might be a big call to say a workshop is capable of building consistently “perfect” bikes, but look at their builds, their trophy cabinet and an achievement almost unheard of; Jesse’s first build at a tender age went straight onto the cover of a magazine. 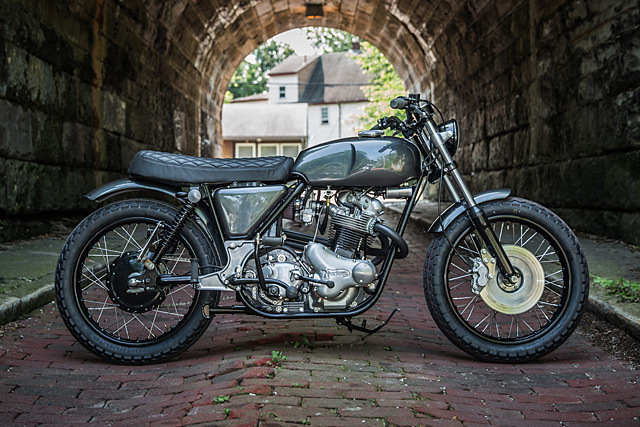 Jesse and his right hand man Tim Fiorucci have been impressing the best motorcycle judges in the world for the last few years so it’s no wonder the owner with his high expectations chose them to rebuild his Norton. This particular Commando 850 had spent the past twenty years of its life gathering dust in the corner of a shed and so upon arrival at The GasBox there was a lot to do. Nothing short of a complete strip down and rebuild would be acceptable and given that perfection takes time the owner was prepared to be patient. With a bare frame to work with the rear hoop was shortened significantly to remove the overhang that the standard frame offers. The frame now ends where the seat does rather than the original which continues to run back to offer support to the now deleted tail light and plate holder. At first glance the 850 frame appears to be standard but this shortening of the frame gently cleans up the look. The other distinct feature of a Commando is the large rear fender, this too is gone with a GasBox shorter item in its place. With the rear end significantly tidied up the front end received similar treatment with a much smaller front fender fabricated that balances the ratio of material removed front to rear compared to a stock model. 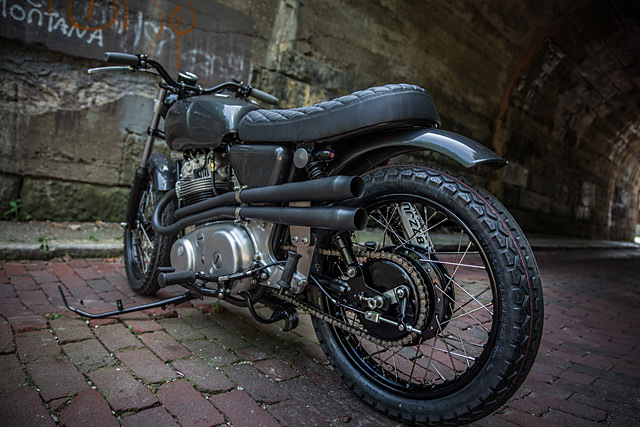 During the build it should be remembered that Jesse and Tim also had four other GasBox bikes to build and three shows to attend, not to mention the daily jobs that any workshop has to handle. With all this going on the decision was made to rebuild the entire engine and transmission, Jesse is a master at finding rare vintage parts and isn’t fazed by what he might confront from an engine that has been sitting for decades. 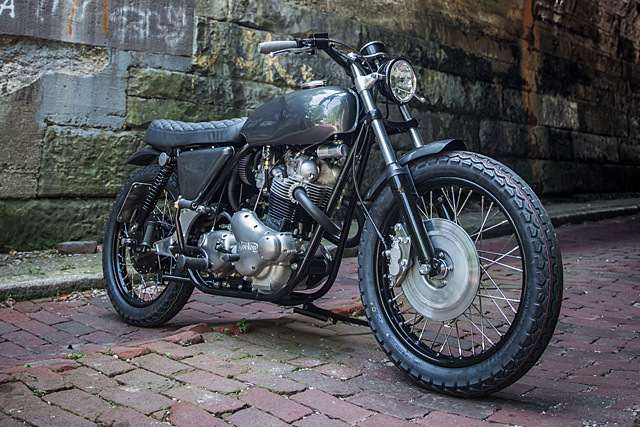 The classic Norton air-cooled OHV parallel twin is now as good as when it left the hands of the brilliant Norton engineers, the two-piece forged crank spinning on new mains, gaskets are all new, so too all filters and even little details like replacing the fuel lines to ensure perfect running operation. On the outside of the engine what wasn’t painted or powder coated black was thoroughly cleaned and polished with the aluminium given a satin finish with other stock hardware zinc plated. 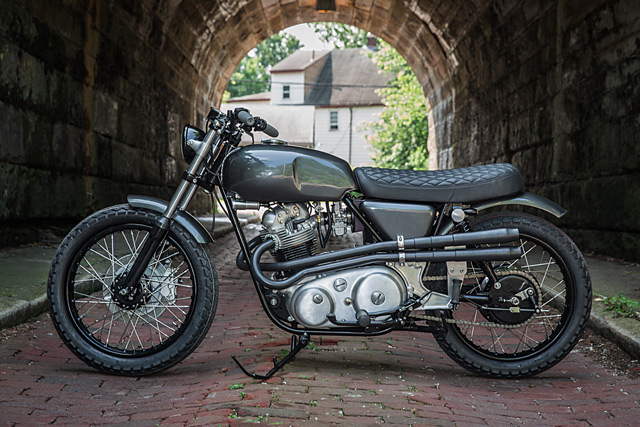 The main custom touch to the engine is the in-house fabrication of the high mounted, scrambler-type twin exhausts that exit stage left. 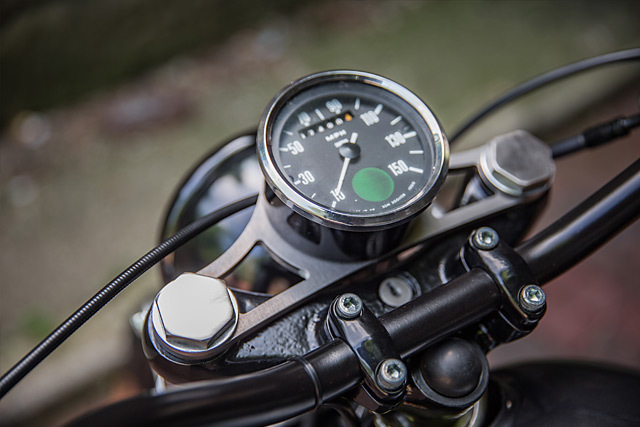 The electrics of a Commando 850 were considered quite advanced at the time for a British machine but Jesse has brought them in line with 2015 standards to ensure everything works when and how it should. One of the other advanced for the times features of the Commando was the vibration reducing Isolastic system which has now also been renewed separating the rider from the jarring of the torquey twin! 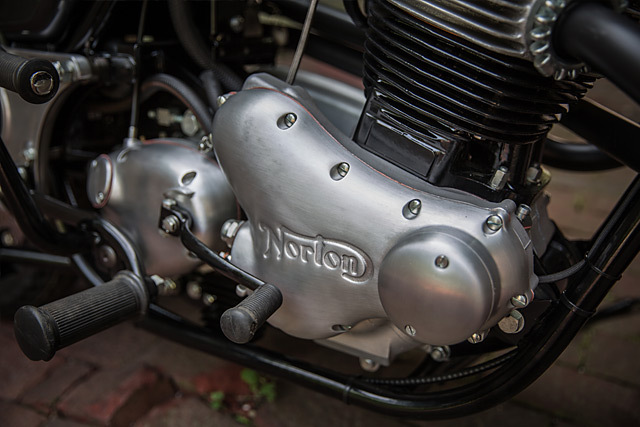 By today’s standard the Norton’s front end was a relatively simple one, but in keeping with the rest of the build The GasBox boys have found ways to clean it up further. The modern electrics allow for the fitment of a new, smaller headlight that is housed in a black casing to blend with the blacked out triple trees. The gaudy rear light is gone and in its place are a pair of small brake lights cleverly fixed just behind the rear shock mounts. 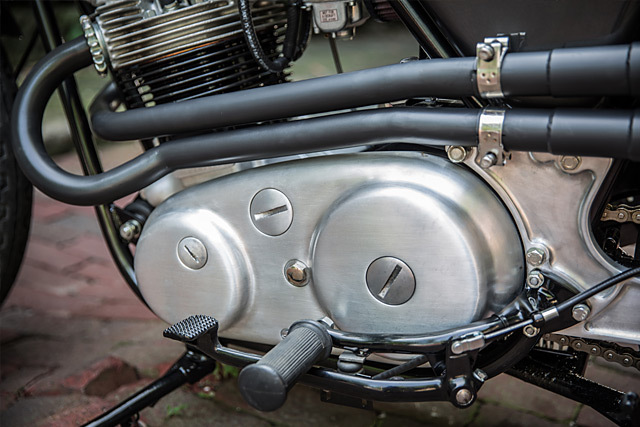 The dual instruments have been scrapped for a single speedo held in place by a beautifully fabricated bracket. 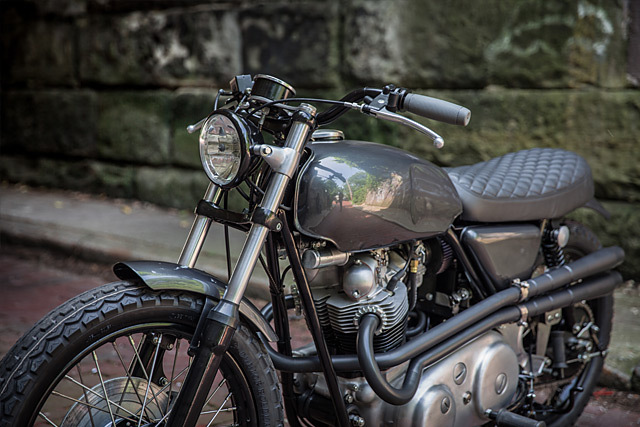 While the bars wear a new brake master cylinder, custom switches and the ever popular Biltwell rubber grips. With such an immaculate base now complete it would be easy for a builder to make wrong wheel and paint choices and in one move destroy all their hard work. But the consistency with which Jesse makes the right design decisions is no fluke. The wheels themselves have been respoked with brand new stainless items into blacked out rims before being wrapped in period correct Dunlop Roadmaster TT100 tyres. 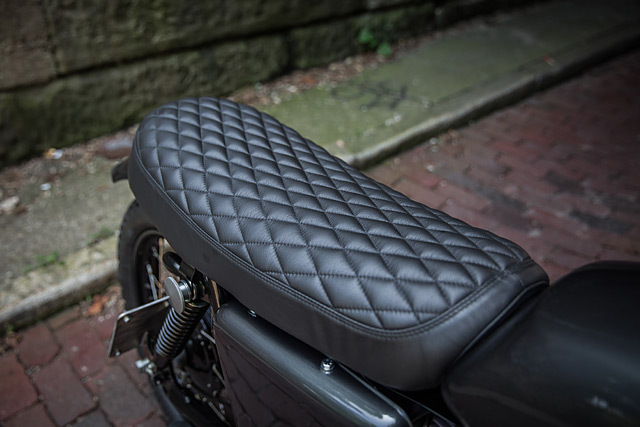 The seat is a custom item, it doesn’t shy too far away from the Norton look, but the quality leather and brilliant stitch work make a statement of their own. Finally the colour choice for the straight as an arrow metal work had to be made, a colour that would fit the classy and sophisticated look of the build. This part was actually easy, the owner of the bike drives an Aston Martin in grey, so the same colour was applied to the Commando with the finish Aston Martin quality from the gun. If you’re going to have two grey Brits at home an Aston and a Norton of this quality certainly beat playing house with The Two Ronnies. And that ends another picture perfect GasBox build, words and photos don’t do it justice but it’s hard to see how yet again Jesse and Tim won’t be receiving both the plaudits of the entire industry for their work and a few more trophies along the way.